The Chat House in South Croydon is a well established restaurant having been open for some years now. We've always liked the quality of food there, so we decided to go back and review the restaurant to see how standards were being maintained. We weren't disappointed when we turned up at around 9.00 pm. Our table was available immediately, and although the restaurant was about half-full the atmosphere was pleasantly quiet but not dead. The other benefit of turning up before ten was immediate service from the polite well-mannered staff. Starters in the form of the obligatory puppadums and relishes were delivered to the table in minutes, shortly followed by drinks. Another advantage of a restaurant that matches demand with capacity this evenly is the unhurried atmosphere. 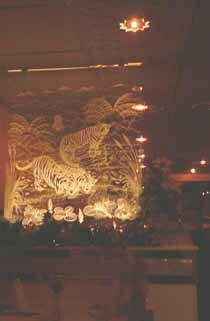 Although given advice by the head-waiter there was no pressure to order quickly from the large and impressive menu. Our selection eventually included lamb passanda, and two chicken dishes we'd never heard of before - feeling adventurous. 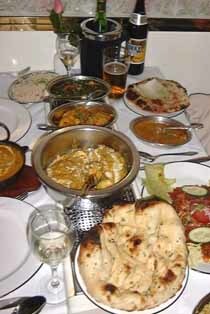 Three types of rice and three different forms of naan bread, plus Sag Aloo and Aloo Gobi were added as accompaniments together with the traditional Cobra beers and a not not so traditional Chardonnay white wine. Waiting time was again impressively short, no more than ten to fifteen minutes so the usual arguments over shreds of remaining puppadums were thankfully avoided. The quality of the food couldn't be faulted, and arrived freshly cooked and hot, which is important. Each dish lived up to the description in the menu and the mixture of tastes was incredible. The cocunut rice recommended by our waiter complimented the chicken wonderfully. Quantities were generous and despite some pretty determined efforts there was still an embarrassing quantity of food left over at the end. We were given several attempts though in the unhurried setting, and were encouraged to stay for coffees. By the time we left at around eleven the place was beginning to get more busy and the waiters were obviously getting ready for the brisk trade as the local drinking establishments ran dry. Our meals came to just over £20.00 per head, but we did choose an expensive wine, and two of our dishes were the chef's specials. If something a little less ambitious were ordered, and the eyes were not quite so bigger than the belly, you're looking at around fifteen pounds per head at the Chat House which has got to be good value with the quality of the food and service. The surroundings are good too, with high quality furnishings and a modern feel to the lighting. Overall rating - well worth a visit.